Jenny comes to the Daily Politics from a background that includes working in the City, writing a book and reporting for BBC Five Live - and all this from someone who describes herself as "a child of the '70s... just"! Born in Windsor, Jenny spent most of her childhood in West Africa and Australia thanks to her father's job as an engineer. She studied at a convent before reading Economics at King's College, Cambridge. From there, she joined the Bank of England where she worked as an economist in the international division. She spent two very happy, very sociable years in the City before leaving to join Reuters news agency. Jenny's seven years writing for the wires were focused mainly on economics, but also involved a year in Amsterdam covering everything from war crimes at the Hague to local drug and prostitution laws. Then it was back to Britain, the next six months dedicated to writing a book, The Living Economy, at which point Jenny found herself "suffering from a severe case of the seven year itch". The agency's loss was the BBC's gain: Jenny has been appearing regularly on the One, Six and Ten o'clock News as their economics correspondent. 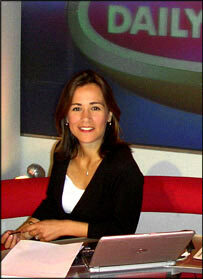 She also managed to fit in a stint covering Wimbledon and co-presented the Weekend Business on Radio Five Live. Her move over to politics kicked off during the election when she joined the Charles Kennedy battle bus for the duration of the campaign. "It whet my appetite...and here I am." We want to hear what you make of politics -- and of the programme. Email us at daily.politics@bbc.co.uk or using the form below.